My unscientific research shows that women like chocolate more than men. Futher, on average, women eat more chocolate than men do. 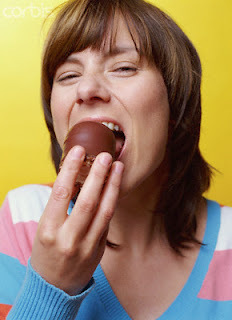 Do you know a woman who would eat chocolate every day for a whole year? Honestly, I can't recall of anyone around me to be such a masochistic chocolate eater but our dear Juliet. So, let's devote this post to her. You see, scientists in the UK are seeking 150 women to eat chocolate every day for a year in the cause of medical research. The scientists doing this trial would like to find out whether a natural compound found in cocoa, the main ingredient of chocolate, could cut the risk of heart disease among women with diabetes. Participants must be postmenopausal women under the age of 70 and will have their risk of heart disease tested on five occasions during the year to see whether change occurs. Well, if the scientists prove their hypothesis, then based on the amount of the chocolate that Juliet eats daily, she will please you with her posts for the next 100 years!